Commentary on a Harmony of the Evangelists, John Calvin, 1558: Luke 2:15-21. "We should be more delivered from errors in judgment and practice, did we more fully ponder these things in our hearts." "They are not taken up with the angels, the glory that invested them, and the lofty strains with which they filled the air. Nor do they say, Let us go and see if this be true--they have no misgivings. But 'Let us go and see this thing which is come to pass, which the Lord hath made known unto us.'" "A mother forgets none of those things which occur respecting her children." Commentary, Luke 2:15-21, (Name of Jesus), Joy J. Moore, Preaching This Week, WorkingPreacher.org, 2012. "Such was the miracle of Christmas. Familiar anticipation paralleled with signs of doubt, fear, and wonder." Jesus' Purification and Destiny Foretold in the Temple, audio telling, story in episodes, graphic, audio and written commentaries. Go Tell Communications, Biblical Storytelling for the Global Village, 2012. Comentario del Evangelio, San Lucas 2:15-21, por Doug Avilesbernal, Working Preacher, 2012. Extraordinary News-Verse Commentary on Luke 2:8-20, Dennis Bratcher, Christian Resource Institute. "In contrast to the heavenly fanfare in the previous scene, the birth of Jesus couldn?t have been more down-to-earth." "Mary - Magician or Model," Mary, Mother of God, Fr. Gerry Pierse, C.Ss.R., from Sundays Into Silence: Reflections on the Sunday Gospels in the Light of Christian Meditation. Claretian Publications. "It is often easier to light a candle in the church than it is to follow the example of Mary...who expressed [her] faith in deeds rather than in words." "Fear Not," Rev. Bryan Findlayson, Lectionary Bible Studies and Sermons, Pumpkin Cottage Ministry Resources. Includes detailed textual notes. "Mary; The Good Sister-in-Law," Mary, Mother of God, Fr. Gerry Pierse, C.Ss.R., from Sundays Into Silence: Reflections on the Sunday Gospels in the Light of Christian Meditation. Claretian Publications. "Her greatness was in her ordinariness, and her power now is in the feeling that she is someone like a sister-in-law that you can sit down and have a cup of coffee with as she throws sensible light on whatever problem is bugging you right now." 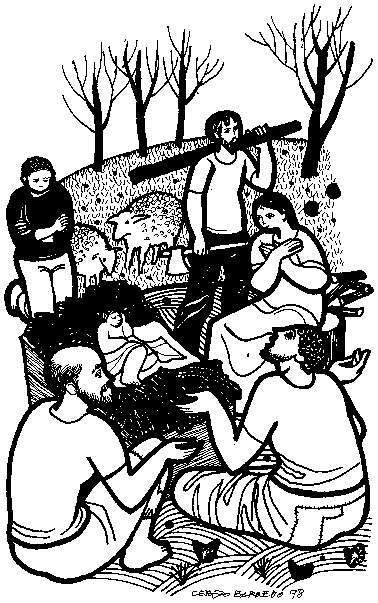 Luke 2:16-21, at Cerezo Barredo's weekly gospel illustration. Liberation emphasis. Images for this week's readings, Circumcision/Nativity/Shepherds Pitts Theology Library Digital Image Archive. Hymns with Scripture Allusions: Luke 2:15, 20. The Cyber Hymnal.